Luke Ives Pontifell says it best: “In this age of disposable communication, when we delete correspondence, store memories in the Cloud and turn off books with a button, a note that you can touch, share and keep is an ever more powerful way of expressing yourself.” Amen. “You don’t wear polyester because it doesn’t wrinkle like silk, or have linoleum instead of marble because it’s easier to clean, so why send a virtual invitation when paper is that much more meaningful?” Brilliant. 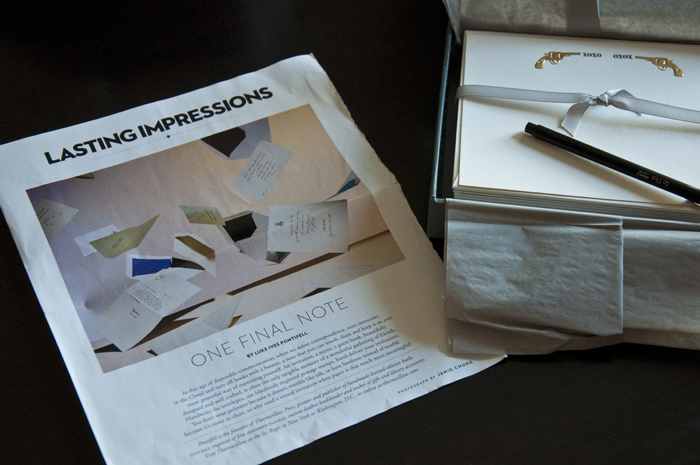 Doesn’t that make you just want to reach for some luxe paper and pen a note immediately?! Luke Ives Pontifell is the founder of Thornwillow Press. His engraved fine stationery is, in a word, swoon-worthy. He can be found in New York at the St. Regis, or on the world wide web. P.S. That box of gold guns is the handiwork of Connor Stationery.